Pizza Delivery – Our handmade pizzas are delivered to your home or office on base, 11 a.m.-8 p.m. Mondays – Fridays and 4-8 p.m. Saturdays. To place your order, call 719-574-8863. Enjoy good food and good beer in Stripes Pub. Click here to see our menu. Mondays: Open at 11 a.m. for lunch Mondays – Fridays. Tuesdays: Steak Night, featuring an 8 oz Rib Eye for $10, and a 16 oz T-Bone for $14. All steaks come with baked potato and salad. Starting at 5 p.m.
Wednesdays: Family Night Pizza Buffet, 5 p.m. Features a variety of pizzas, fresh salads and toppings. Adults, $7.95; Kids ages 6-12, $4.95; Kids age 5 and younger, $2. Thursdays: 50-Cent Wing Special – Bone-in or Boneless, your choice, 5 p.m.
Fridays: TGIF BUFFET, 5 p.m.; Social Hour, 3:30-5:30 p.m. with snacks and drink specials. Join us for Final Friday fun, 2:21-5:30 p.m. the last Friday of the month. Saturdays: UFC – Live on Pay Per View, as scheduled. 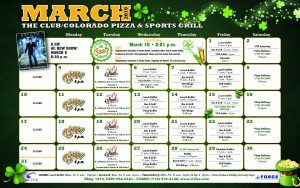 For more information about events in Colorado Pizza & Sports Grill, call 719-556-4181. Enjoy the camaraderie at the Sunday, Monday and Thursday football games. The action never stops. And with DirecTV / NFL Network, patrons can watch any out-of-market NFL game. Sunday football action starts at 11 a.m.; Monday and Thursday night kickoff is usually at 6:30 p.m. Enjoy pizza and beer specials during every game. 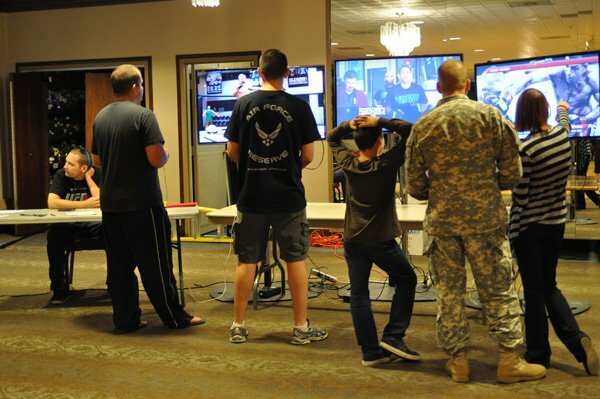 For our Super Sunday Celebration, The Colorado Pizza & Sports Grill hosted a super tailgate party. We served A SUPER spread of great food and lots of it. And at half time, our tasty junk food buffet! We watched the game in the Colorado Pizza & Sports Grill and in the Main Lounge on our big screen TVs, got great door prizes, and enjoyed drink specials throughout the game. Always an exciting time in the Colorado Pizza & Sports Grill. From one surprising NCAA basketball game to the next, these playoff games are real nail-biters. That’s why we bring out our awesome food and drink specials. We know you need something TASTY to munch on. 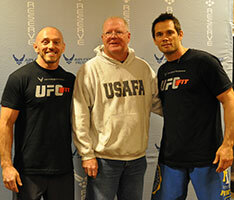 Club Manager Curtis, center, poses with UFC FIT Coach Mike Dolce, left, and former UFC Middleweight Champion Rich Franklin at a special UFC FIT Experience at The Club on October 3, 2013. 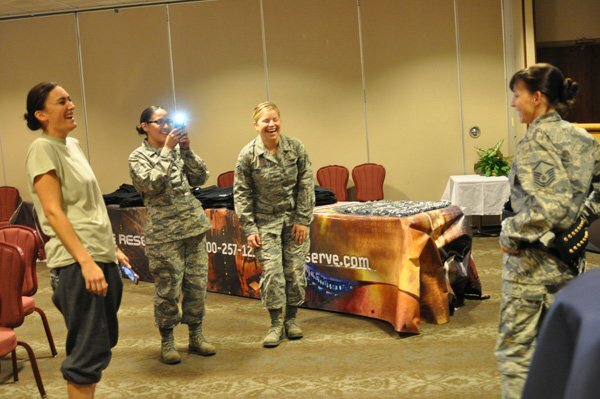 The event was sponsored by the Air Force Reserve. 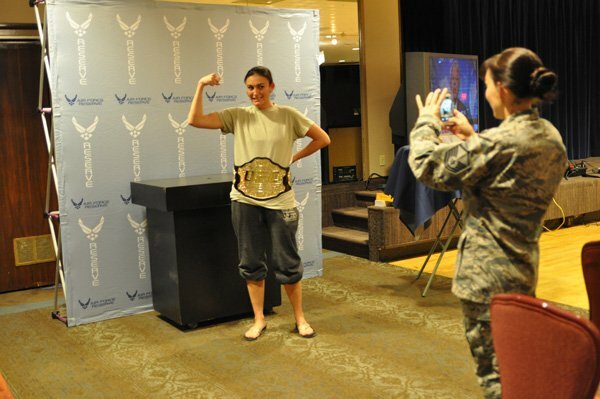 When UFC FIT Coach Mike Dolce and former UFC Middleweight Champion Rich Franklin visited The Club in 2013, they both admitted to having wrestled with poor diet and weight issues in their lives. 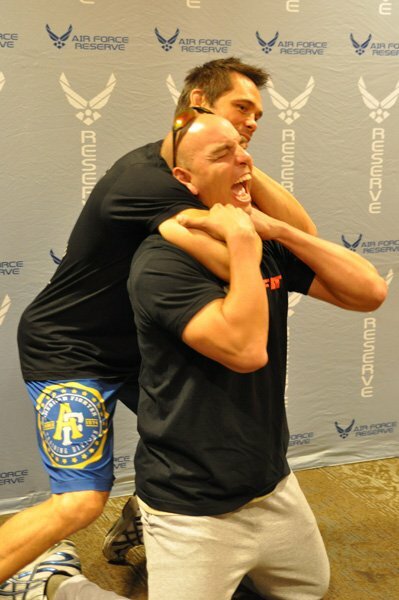 But Dolce and Franklin have made a life-long commitment to making healthy food choices and staying physically fit. And it shows. 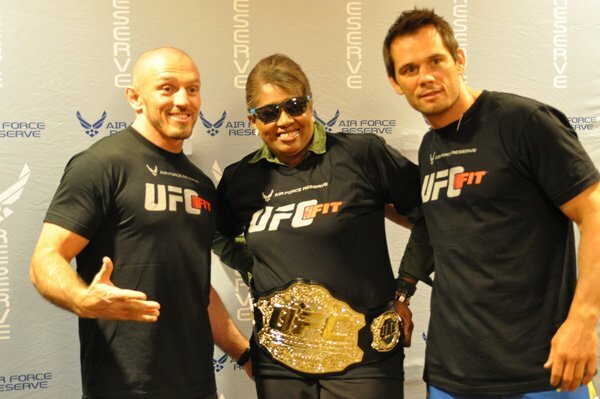 Thanks to the Air Force Reserves for bringing Coach Dolce and Rich Franklin to Peterson AFB to share their message of a UFC FIT life. Members of the Peterson Boxing Club really support the UFC and MMA events televised at Stripes Pub. But they’re not the only ones. 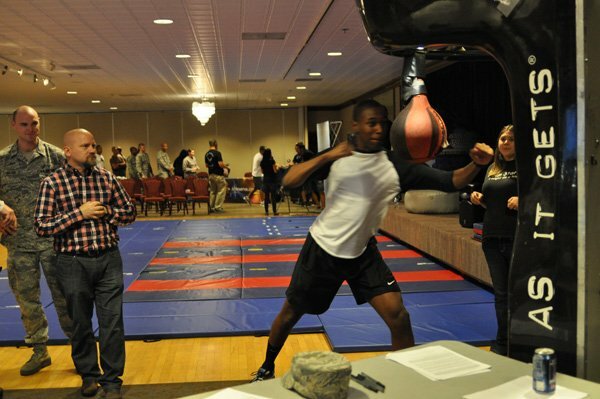 Stop by the Colorado Pizza & Sports Grill and see the Peterson Boxing Club’s mementos. 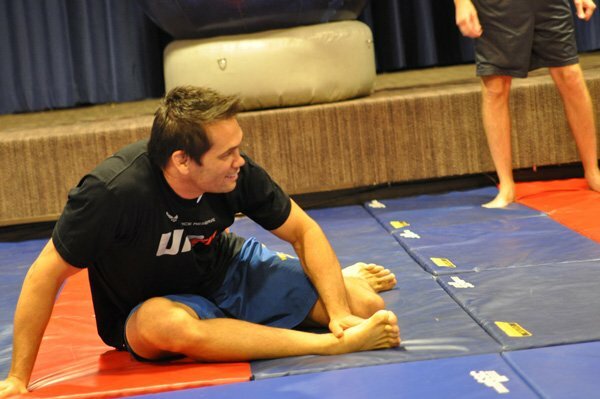 Enjoy these photos of Coach Mike Dolce’s and Rich Franklin’s visit to The Club. 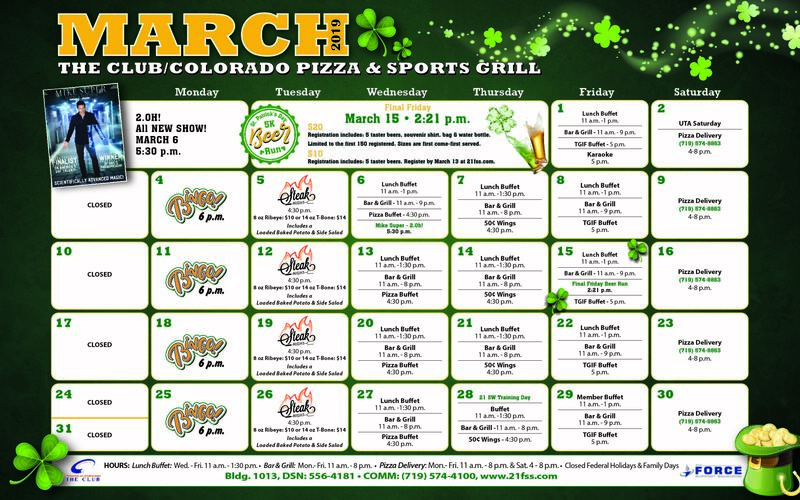 From Colorado Rockies Baseball to the Olympic Games to The Masters, the Colorado Pizza & Sports Grill televises the events YOU want to see. It’s always a party here. Mon-Fri – 11 a.m.-8 p.m. Sat – Pizza delivery 4-8 p.m. Open 11 a.m.-8 p.m. on UTA Weekends.